The Ashoka Library contains an edition of Ashoka’s inscriptions ordered into ten types1 as seen in the menu on the left. The texts and translations are so far based upon Hultzsch (1925). Input of texts and images was undertaken by Jens Braarvig and completed in May 2014. Matthew D. Milligan has reread and corrected the texts. The site will also publish the rest of the known inscriptions, and, further, images and secondary materials on the topic for both educational needs and research. The development of the library is a cooperation between indological milieus at Texas University, Austin, and at Oslo University. Below is a project description which is the basis of the cooperation. Other contacts are also being made to build the site further. The persons involoved so far are: Joel Brereton, Donald R.Davis, Oliver Freiberger, Janice Leoshko, Patrick Olivelle, Texas University; Ute Hüsken, Klaus Peter Zoller, Jens W. Borgland, Jens Braarvig, Oslo University. 1) Type I is contained in paragraph numbers 1-2, pragraph 1 having only one inscription and the English translation in each field, while paragraph 2 is the same type as in paragraph 1, but in a synoptic format. The types II-X correspond to the paragraphs 3-11. The Ashoka Library: A cooperation between Texas University, Austin, and Oslo University. The cooperation between TU and UiO has been very successful, in particular in exchanging teaching staff. There is thus all reason also to develop research activities with the frame of the cooperation to serve also the more advanced research students, as well as developing projects involving the scholars from both institutions. This has been accomplished to some degree between individual scholars, but it is the opinion of the undersigned that more stable projects, involving doctoral students and research staff, definitely have their place within the framework of the cooperation. Ashoka, as is well known, was the first ruler to politically unify what we today call India under his rule in the 3rd century B.C. As such his dynasty, the Maurya, is of central importance for any historical study of India. 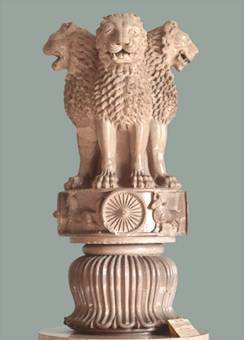 However, also in the modern construction of India Ashoka has played a great role as a unifying figure, thus the Indian flag as adopted at the independence in 1947 has the “Wheel of Ashoka” as its central symbol. Thus the study of Ashoka is crucial to understand Indian history and its projection into the present. Ashoka has throught history represented an imperial ideal of just rule throughout Indian history, and even beyond India, since Ashoka has also this function in Buddhism, where he symbolises the Dharmarāja, “King of Religion”. A project on Ashoka will thus be a cross-displinary undertaking involving archaeology, palaeography, philology, history, religious studies, identity studies, political science and other disciplines. 1. The beginning of writing in India is connected with the rule of Ashoka, as the earliest examples of writing are found in is famous edicts promulgated as inscriptions on stone extant until today. Two writing systems seems to stem from his time, namely the Kharoshti, which has died out, and Brahmi, which is the forefather of all modern Indian writing systems, as well as those of Tibet and South East Asia. These writing systems were both modelled on the writing systems of the Aramaic language, employed by the Persian rulers as a lingua and scriptura franca. 2. The edicts of Ashoka, where he promotes a mild form of rulership, are by many quoted as an early examples of a rule involving the respect for human rights and religious freedom. The edicts of Ashoka were also written in Aramaic and Greek, which bear witness to the fact that Ashoka wished to project his power westwards. 3. As shown in the inscriptions of Ashoka he had interest in developing communication with countries outside his own. The interaction of the Maurya dynasty with the Hellenistic civilizations is also documented in Greek writing in the earliest Greek writings on India, as in the Indica of Megasthenes (350 – 290 BC) who was sent on a political mission to Candragupta, Ashoka’s grandfather. Thus Ashoka’s reign together with Alexander’s campaign is the start of a more extensive interaction between the Mediterranean and Indian civilizations, which is not very well understood, though confirmed by both archaeological and written records. 4. Ashoka is the royal ideal above all in Buddhism, and thus there is a plethora of legends of him in the Buddhist traditions in Sanskrit, Tibetan and Chinese. Most of this literature has been edited, but is often difficult to access. As for its study and analysis much remains to be done. 5. It is generally believed that Buddhism gained foothold and momentum only under Ashoka, who seems to have sponsored religion in general, and probably Buddhism in particular, as documented by his inscriptions. The main split in Buddhism, between the Sthavira and the Mahāsāṅghika, probably also happened during his reign. Much remains here to be analysed, to distinguish what is real history and what is legend. 6. There is quite an amount of research on Ashoka, recently a book has been published on Ashoka as an historical figure as well as an ideal employed to construct modern Indian identity, Patrick Olivelle, Janice Leoshko, Himanshu Prabha Ray: Reimagining Ashoka. Another work, documenting the finding places and landscape context of the inscriptions has recently been published by Harry Falk in Aśokan Sites and Artifacts. However, the materials on Ashoka is not always easy to access, and the first undertaking of the present project would be to digitalize as much of the archeological materials as possible, including the inscriptions as images and transliterations as well as translations. Further, the legends and written sources on Ashoka should be digitalized to the extent that it is not yet done. In this way the materials can be made available on the internet for general research. 7. The first financial need of the project is to make the relevant material available as described in the previous paragraphs. For digitalizing and making the materials ready for “The Digital Ashoka Library” we will work with the AIIS and their Indian partners. Priority will be given to have all Ashoka’s inscriptions available in one place, then after that the historical literature on him, as well as research publications. The Bibliotheca Polyglotta is an internet facility that makes input of text and images easy, and will be employed for the purpose. 8. Later one might envisage doctoral grants for students who wish to build up the library with their research, and any scholarly activity in the project will be published on the internet as well as in printed books and papers as needed. 9. As is the rule in both universities, instruction and teaching should be based on research. Thus the Ashoka Library, as planned below as our first theme in such cooperation, will also serve as an important teaching resource, since all students of India should know something about Ashoka. TU and UiO should be very well positioned to work together on the project, given the relevant expertise found in our two universities, and well placed in finding other relevant partners.